I found the attached price list for text books in an old textbook from 1909. That was 105 years ago. I thought it was interesting. 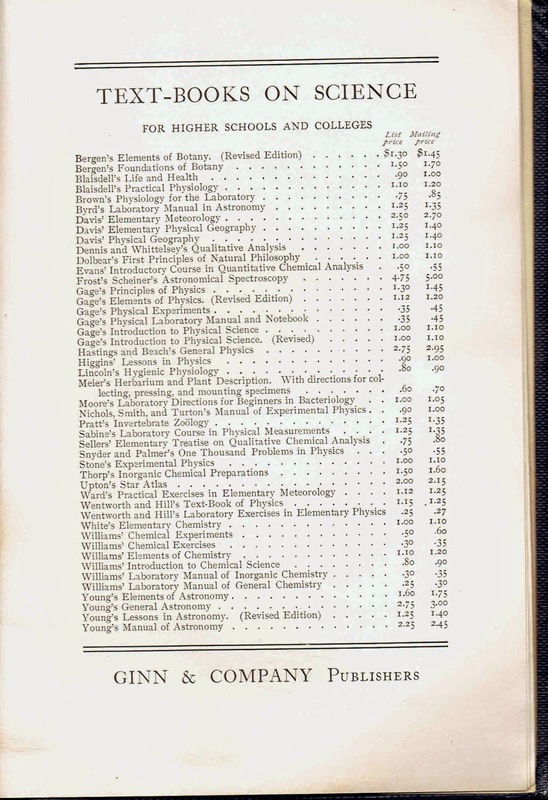 Textbooks back then were as little as 25¢ The average of the numbers listed there is $1.17. Textbooks cost a little bit more today. I found in an article from Kiplinger that the new textbooks were $72 average last year. I'm not too confident in that number as it seems lowish to me and I don't' see a source cited but I think $72 isn't unbelievable. If textbooks were $1.17 in 1909 and $72 today then that equates to a 4% annual increase rate over 105 years. The inflation data from CPI only seems to go to 1913 but thats fairly close to 1909 for my purposes so I'll call it good enough. Inflation from 1913 to 2014 was 3.2% per year cumulative. 4% versus 3.2% doesn't seem like a big difference but over 100 years that matters a lot. If textbooks had only gone up 3.2% over 105 years then they'd be around $32 today but they're more than double that. Note : This is mostly anecdotal information for fun. I only have one list of prices from one publisher and all the books are in the science field.